SETH’S PICK :: BLACK BEETLE #2: In a week where there are several books I’m interested in picking up (Nova, Thor, Avengers, Baltimore, Captain America), I find myself being most excited about Black Beetle. After just 2 issues (0 and 1), it’s a given that this series will deliver a certain level of quality and entertainment. This shouldn’t really be a surprise, since it’s being written and drawn by Eisner winner Francesco Francavilla. I guess the thing that stands out most about this book in my mind is that, while it is full of wonderful art, a memborable pulpy character, and lots of energy, the book feels almost effortless. It’s a simple and fun read, and while you know lots of hard work went into it, the work doesn’t tax the reader. For that reason, it reminds me of Hellboy. Both titles have an insane amount of planning and execution in them, but you can pick up any issue knowing you’ll get a well-crafted comic that entertains you just as much as it impresses you with its craftsmanship. HOW can you pass up that cover???? Righteous, pumped for this as well Seth. Wouldn’t have known about it without #0 in your staff picks. I first knew of Francavilla from the Captain America & Black Widow team up recently and loved his art. Glad to see his overall storytelling is just as strong. 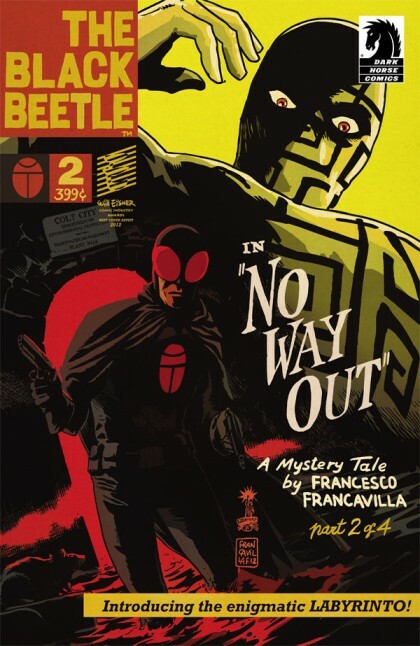 I’ve been a Francavilla fan since reading “The Black Coat” several years ago. This series does not disappoint…it’s a perfect book!